The beginning of April saw the publication of the four latest volumes in The Complete Works of Sangharakshita, bringing the total number of published volumes to twelve. With fifteen more volumes yet to be published, this ambitious project, due for completion in 2024, is almost at its halfway point. 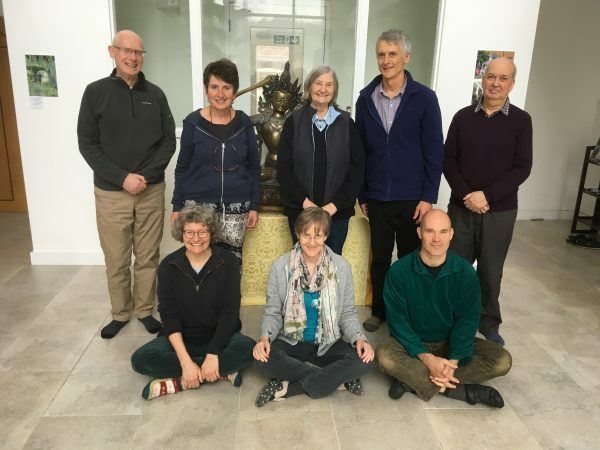 Last week members of the Complete Works team – most of them volunteers – met at Adhisthana to share their experiences of and perspectives on the project, including the challenges they’ve encountered and the lessons they’ve learned from them. They also looked to the future and discussed ways of ensuring the project’s continued success. Although the day and a half spent at Adhisthana was mostly taken up with meetings, Vidyadevi and Satyalila created a beautiful shrine and Priyananda led a puja, in which each participant read out one of their favourite passages from Sangharakshita’s writings. Also dropping in at various points over the two days were: Michelle Bernard (Publishing Controller at Windhorse Publications) – virtually, via FaceTime; Kalyanaprabha (editor); Dhammarati (designer) and Bodhiketu (Treasurer of Windhorse Publications).